Marsupial moles are marsupials that belong to the order Notoryctemorphia. They live in the Australian desert, where they burrow in the desert sand. Like true moles, marsupial moles spend most of their lives underground and their bodies are adapted to a burrowing lifestyle. The physical similarities between the marsupial mole and the true mole are a result of convergent evolution, where two unrelated species that live under similar conditions develop similar adaptations. Marsupial moles are generally about four to six inches long. They have short, pale, iridescent creamy-golden fur, cylindrical bodies, cone-shaped heads, short limbs and stubby tails. Like true moles, they are blind, lack external ears and have shovel-shaped front paws. Small lenses under the marsupial mole's skin are all that remain of its eyes. Its ears are small holes in their heads. The lack of external ears makes it easy for marsupial moles to burrow through sand, as does their streamlined body shape. Its hearing is not very good, and it depends mostly on its sense of smell to find food. Its nose is protected by a shield that resembles a fingernail. A marsupial mole has seven vertebrae (neck bones) that are fused together. This keeps the mole's head rigid when the mole is digging. The marsupial mole's pouch faces backwards. This prevents sand from filling up in the pouch. The marsupial mole's diet mainly consists of insect larvae. 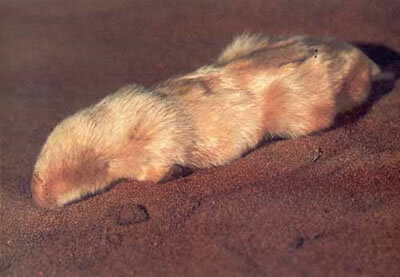 Marsupial moles are adapted to desert heat.Their body temperatures are low and unstable. The marsupial mole's body temperature can vary between 59 and 86 degrees Fahrenheit (15 and 30 degrees Celsius). A marsupial mole will die of hypothermia if the outside temperatures drop below about 59 degrees Fahrenheit. Many marsupial moles have died in captivity because they were not kept warm enough. There are two known living species of marsupial mole: the northern marsupial mole and the southern marsupial mole. The northern marsupial mole lives in central Australia and the southern marsupial mole lives in southern Australia and the Northern Territory. It is very hard to tell the two species apart.